Please also bear in mind why there is an SMBC, and An_dz spends time on it. We want community interaction, and we want screenshots to showcase simutrans. These pictures, when posted on facebook, and google plus, and other platforms always tend to get a lot of attention, which is vital for a community project. I think Simutrans has in Europe is no real community. Otherwise one would work together and not against each other constantly. The best example is the wiki in the course of the last 10 years. You want it, you do not want. And above all, hardly anyone wants to do something about it. And in how far a vote with 20 votes is representative of a community, is more questionable. I think Simutrans has a community, even in Europe, but not European Community since it's part of the international community. It might not be the largest community, and not everyone might be interested in screenshots, but it still exists, has a relatively good climate and is quite helpful. You can't blame the community for not doing what you want, because the community is not bound together by any common goal except to make Simutrans better. Everyone has different ideas about what Simutrans is, so everyone has a different approach on how to commit to the common cause. Be it through programming, pak-creation, networking,... most members of the community do something like that. Some just play, but that's important too. Those who play know best how to make it play better, find bugs etc. - stuff developers sometimes don't do anymore. The wiki is a special case. There were long discussions about it already, and many people told you what's wrong and needed to be changed in order for them to get involved. Nothing changed, so they won't get involved. Blaming those people for not working under your conditions isn't going to change their minds. If An_dz opened this contest claiming he would never do one again if he did not get at least 3 entries, I wouldn't have put even a little time in creating a screenshot. But he did not, instead he nicely asked. And it worked twofold. That's how it works in a community based on voluntary involvement. This is a great community the way it is, so stop complaining about it. It can still improve though - just not with negativity. Improve it by making people want to improve it, voluntarily, the way they see fit. Encouragement works wonders. Simutrans had and has an European community from the start. The first graphical contributions (outside the close german circle around Hajo) were from Finland, and the US. And then in 2002 or so pak128 was started by Tomas Kubes, who is Czech. And now more than ever, there is a pak128.britain, pak128.german, pak128.cz all complete or under heavy development. Not to mention the french SNFOS (albeit those seem a little dormant right now). Simutrans now goes in the 18th year. It is very mature, can be now tailored in many aspect. Obviously efforts will be thinned out, and depend on personal focus. And while the pace seems to slowed in the last half year, the scripting effort of Dwachs brought a full new dimension to simutrans which is only slowly unfolding (despite excellent documentation form the start). But of course scripting will divert attention too. So I see this rather positive: Simutrans became so diverse that there are enough niches suited to contribute for anyone. Simutrans has a rather splendid community - although we do not always agree on everything, we do tend to get along reasonably well for the most part, and there is a goodly amount of positive contribution from many quarters. It would be splendid if even more could be contributed, but thee are only so many of us, and we only have so much time. The best way of increasing the amount of stuff contributed to Simutrans is to popularise Simutrans more, partly by making it better and partly by better publicity; Standard is stable and mature enough to benefit a great deal from the latter, which is why the recent efforts to get it on to Steam have been such a good idea. I concur with the above. As far as online communities go, this is a great group of people who, despite being from all over the planet, with different languages and cultures, manage to work together as a group fairly well and accomplish a lot of wonderful things. Simutrans is mature enough now that it really can cater to a lot of specific interests and has the open development capability to allow users to really explore their own personal play style (my personal pakset project as a prime example). As James highlights, what we need most of all is more engaged people who contribute varied content. With an older player base in general, we are all very busy with families and careers and have precious little time to devote to personal projects like Simutrans. On the flip side, I find that older developers are more likely to stick with a project and see it through to completion/release. Every time something new is released, I feel inspired to continue to do further work on my own projects. I suspect a lot of us experience the same thing. I found a very useful measure of the quality of a community is to consider the number of people one does know in it, and then count how many of those one would invite to stay at their home for a few days. Based on this measure, Simutrans is indeed splendid. Just out of my head: I should trust a dozen people with my keys, on a moments notice. There are many here, I should be delighted to have as friend in the real world as well. I can see however, why Frank has reason to be bitter. He is providing core services for the community that are not sufficiently appreciate, just accepted as given. Tasks like writing documentation and translations are not very popular...It is much easier to find someone to do graphics, or even coding. Nonetheless, my original point, the one that is quoted above, is still, the screenshot contest is an activity of this forum. Which is i think very much the core, or central hub, of the Simutrans community. There is nothing that keeps people who are interested enough in Simutrans to pay attention to screenshot contest to register here, nor should we create incentives not to register. We want them to be here. I agree to everything here. Anyway, I understand what Frank feels: sacrificing time to do things and getting almost no feedback in return. As already said, if there are few members involved in the wiki, it's because everyone is busy with his own life. The wiki can be useful, for sure. For instance, my addon making tutorials are based on information from the wiki. However the problem is always the same: you're a new player, you download and install Simutrans, and then: how do you know that there's a wiki somewhere ? Or tutorials elsewhere ? Or whatever documentation anywhere ? What we lack here is a clear and visible plan of where (what website) you can find what (documentation, tutorials, paksets, addons, nightlies, ...). Sure. It's a quite weird situation I'm in: I quit playing Simutrans a few years ago, but I keep coming back because of the community and then eventually back playing ST. It's the opposite situation I've had with other games: Play and enjoy the game but the community is filled with entitled jerks with short-attention span -> made me hate the game. Anyway, I understand what Frank feels: sacrificing time to do things and getting almost no feedback in return. That is a soul-cutting feeing. If something needs to be fixed is not lack of effort, but being visible and easily accessible. If you pour your time on something, you rather expect to know that your work has been useful and appreciated than being praised or just acknowledged. help text from Simutrans 0.83.1.2 date 02/01/2003 ! 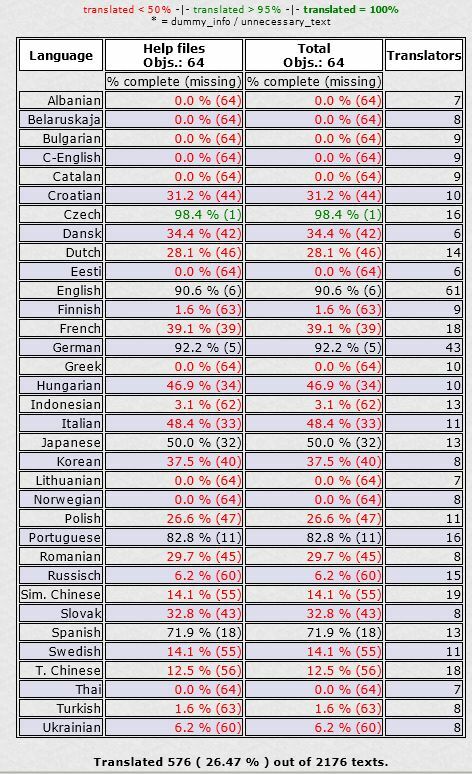 Interesting that English translations show a less proportion translated than Czech or German. What are these missing help texts, I wonder...? In Simutranslater, you can filter for non-translated objects per language. In German, 5 translations are missing, though they are not the same. eg. factory_build exists in German while it does not in english, but the inspection tool is missing. This only shows what is completely missing, not whether existing texts are complete and up to date. As already said, if there are few members involved in the wiki, it's because everyone is busy with his own life. I've updated most of the dat pages to follow the latest version as I extract pak96.comic sources. Adding all available parameters as well as some examples. But now I have some other things to do, so it may take longer for it being complete. I haven't played with the wiki, but maybe I should devote a bit of time to it. Being an English-only speaker, however, my potential participation is somewhat limited in scope, but I'm sure many of the English pages could use some work at any rate. Should there be a button in-game and in the help menus that links the player to the wiki? One point to note is that Simutrans is an Open Source project and as such its the enthusiasts who keep the project alive. That is the basic idea behind it. What I find suprising is how can anyone can call themselves a true participant in Open Source when making demands ... Its all voluntary. When I first heard about Simutrans I was excited cos that is the style of game I love to play. I must admit its was very daunting when I first visited the website, I found ir very confusing but persevered and eventually played. I have since noticed that there is now a lot of info to be found quite easily for the newcomers. Thats progress by volunteers. This is a great community of like minded people from around the world bringing pleasure to anyone interested in the game. We all derive pleasure in different ways, some from coding, graphic creation, administration, etc etc. Open Source is great, it gives great pleasure to many, like the Simutrans community. I must admit it was very daunting when I first visited the website, I found it very confusing but persevered and eventually played. I have since noticed that there is now a lot of info to be found quite easily for the newcomers. *waves* 2013... Probably I'm who to blame. That's the difference between a site made by an architect and another by a web developer.